This is my first foray into #PointShoot and I’m sharing my terrifying experience when our double glazing shatters! There was a sound but not a very loud one. Like a shot being fired. Suddenly we could hear tiny little noises like someone walking across ice that is not sure it is strong enough to carry the weight. We have net curtains up at our windows. I have never liked a bare window and the view into our lives that it gives the outside world. Gradually we could see a pattern emerging beyond the curtain. The hit had been in the centre, but it was at the edges that the noise was coming from. Lucky the glazier who fitted the window was just up the road so hubby went and ordered a replacement. It’s going to take ten days for them to get it and fit it. The cracked window lasted two days then heavy rain persuaded the middle section to fall out. That meant we had to take the whole thing out. After much brushing, sweeping, swearing and getting hot, the shards were put into quite a small box. I was amazed at how tiny the space it needed was. Because the window was double glazed we still have glass. It now steams up when it is wet and cold outside. Took me back to my childhood, before the days of central heating and thicken glass. The wonders of science eh? 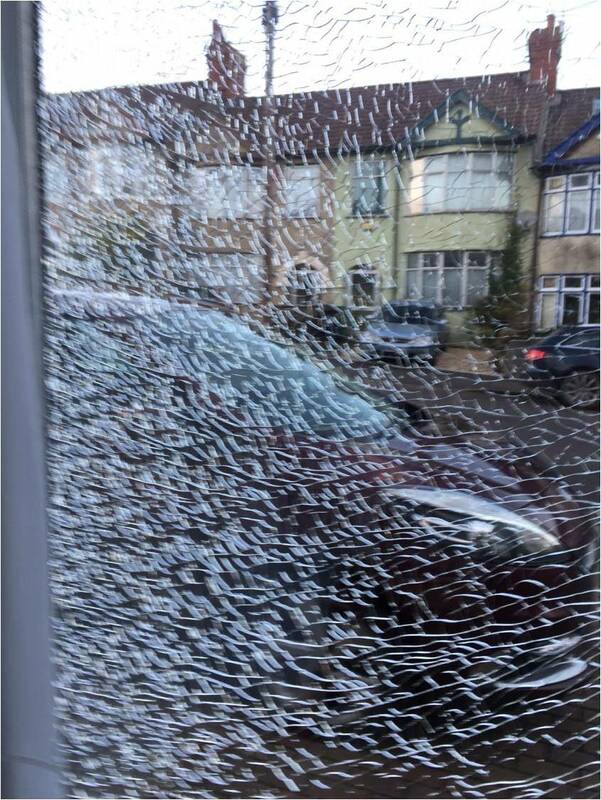 I do wonder though at the speed the car which flicked the stone up that hit the window was going. 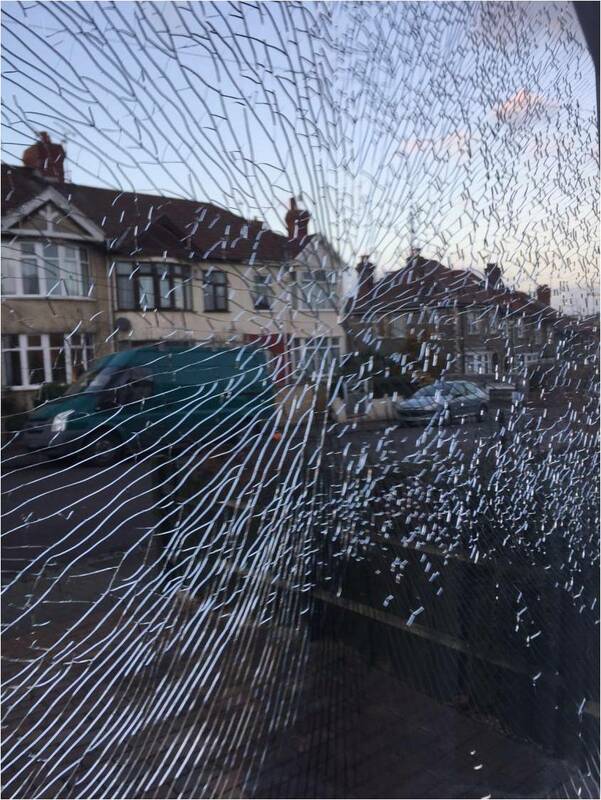 To make double glazing shatter it was certainly way above the 20 mile per hour limit! Click the badge and visit #PointShoot for more stories! I used to work in Home Health and replaced my windshield on a regular basis, usually thanks to a rock getting caught in a truck’s wheel, didn’t matter which direction, could’ve been driving past on the opposite side of the road – a ding centered then making its way across my field of vision. I was lucky nothing happened that something worse resulted but all that was small potatoes compared to your experience. I’m glad you weren’t hurt or the damaged more extensive – the only ripple effect stayed confined. I’ll take a looooooooooong driveway any day…. It was a bit of a shock certainly! Horrid, and a real nuisance to deal with. If it was from a car, I agree it must have been at some speed. Many years ago i was in a car when the windscreen shattered, before the days of laminate. We were on the motorway, children in the back, puppy at my feet. It was awful, but no one was hurt. It was the noise that shook us really. The replacement is just being fitted! Yes, definitely Tess. If it had fallen out we would have been very scared and VERY cold!